Birthday Giveaway! Applebee’s $20 gift card! Hey all! Well, since this is my birthday week, I decided to do a giveaway that is close to my tummy. 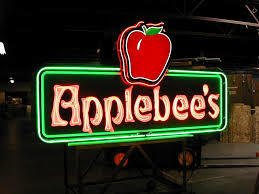 My friends and I call Applebee’s out “hang out spot” when we just need to meet up, talk, eat, and giggle. We always have a good time there. Maybe it’s just the Applebee’s we go to, or maybe it’s because we are cool chicks that are fun to be around(probably the first reason), but no matter what, we leave there in good spirits. Now, I want to be able to provide that for you! Whether you use this to be part of the new 2 for $20 deal they have going on, or you’re on a weight watchers diet and what to treat yourself and a dieting buddy to a night out with “real” food…..it’s a great place to go! So, one lucky winner will get a $20 dollar gift card from 4 hats and frugal. This contest will be open from Sunday, March 15th to Friday, March 20th at 11:59pm EST. The winner will be picked on Random.org and announced on Saturday, March 21st.